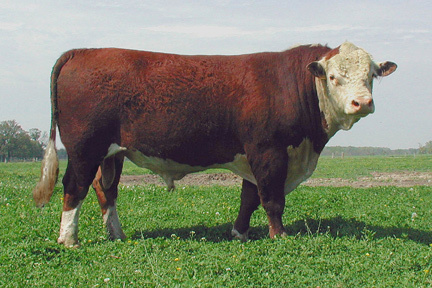 Polled Hereford are medium framed cattle with distinctive red body color with the head and front of the neck, the brisket, underside, and switch in white. They have well developed fore-quarters, a deep brisket, broad head and stocky legs. Polled Herefords are generally docile and fast growing cattle with good beef quality. Today the Polled Hereford registry is combined with the American Hereford Association.